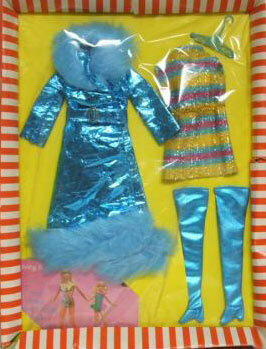 This is one of Barbie's more "far out" (do people still say that?) mod ensembles. It is very popular with collectors and can be very hard to find and therefore very valuable. The sleeveless knit mini-dress is yellow, blue and orange striped with metallic threads woven throughout. It has a thin gold metallic tie belt. The blue maxi-length coat is shiny blue metallic with blue fur at the collar and hem. It has a matching belt with a buckle. The hip high boots are blue metallic jersey. The boots are very prone to fade and show wear.